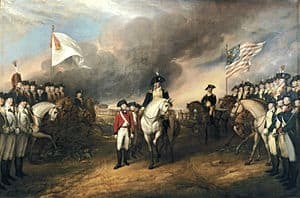 The Siege of Pensacola was fought in 1781, the culmination of Spain’s conquest of the British province West Florida during the American War of Independence. When Spain entered the War in 1779, Bernardo de Gálvez, the energetic governor of Spanish Louisiana, immediately began offensive operations to gain control of British West Florida. In September 1779 he gained complete control over the lower Mississippi River by capturing Fort Bute and then shortly thereafter obtaining the surrender of the remaining forces following the Battle of Baton Rouge. He followed up these successes with the capture of Mobile on March 14, 1780, following a brief siege. Gálvez began planning an assault on Pensacola, West Florida’s capital, using forces from Havana, with the recently captured Mobile as the launching point for the attack. However, British reinforcements arriving in Pensacola in April 1780 delayed the expedition, and when an invasion fleet finally sailed in October, it was dispersed by a hurricane a few days later. Gálvez spent nearly a month regrouping the fleet at Havana. Following the outbreak of hostilities with Spain 1779, General John Campbell, concerned over the condition of the defenses, requested reinforcements, and began construction of additional defenses. By early 1781, the Pensacola garrison consisted of the 16th Regiment, a battalion from the 60th, and 7 (Johnstones) Company of the 4th Battalion Royal Artillery (Present day 20 Battery Royal Artillery, 16 Regiment Royal Artillery). These were augmented by the Third Regiment of Waldeck and The Maryland Loyalist Battalion as well as the Pennsylvania Loyalists. These troops were provincial soldiers, rather than militia. In addition to the Loyalist soldiers, many Native Americans supported the British. After the fall of Mobile in March 1780, between 1,500- 2,000 Indians had come at various points to Pensacola for its defense, including Choctaws, and Creeks, with Creeks being the most numerous. Just before the Spanish attack there were only 800 Native American fighters left in Pensacola, as Campbell, not realizing the attack was imminent, had sent about 300 away. During the siege and battle there were ultimately only about 500 natives left defending Pensacola, due to diplomatic efforts of the Muscogee Creeks to take a more “balanced” role by offering some supplies to both sides and diminishing the role of their fighters on the British side. The majority of native peoples still present defending Pensacola during the siege were Choctaw. Gálvez had received detailed descriptions of the state of the defenses in 1779 when he sent an aide there under the guise of discussions concerning the return of escaped slaves, but Campbell made numerous changes in the intervening years. Pensacola’s defense works in early 1781 consisted of Fort George, an earthen works topped by a palisade that was rebuilt under Campbell’s directions in 1780. North of the fort he had built the Prince of Wales Redoubt, and to its northwest was the Queen’s Redoubt, also built in 1780. Campbell also erected a battery called Fort Barrancas Colorada near the mouth of the bay. Gálvez embarked his flag with the Spanish fleet, under the command of Captain José Calvo de Irazabal. With about 1,300 men, the regular troops included an Majorcan regiment and Arturo O’Neill (later Governor of Spanish West and East Florida) commanding 319 men of Spain’s Irish Hibernia Regiment, and including militias of biracial and free Afro-Cubans. Gálvez had also ordered additional troops from New Orleans and Mobile to assist. The Spanish expeditionary force sailed from Havana on February 13. Arriving outside Pensacola Bay on March 9, Gálvez landed some troops on Santa Rosa Island, the barrier island protecting the bay. O’Neill’ Hibernians landed at the island battery finding it undefended, and then emplaced some artillery, which was then used to drive away the British ships in the bay. Getting the Spanish ships into the bay turned out to be difficult, as it had been in the previous year’s capture of Mobile. Some materials were unloaded onto Santa Rosa Island to raise some of the ships, but Calvo, the fleet commander, refused to send any ships through the channel after the lead ship, the 64-cannonSan Ramon, grounded in its attempt, citing that danger, and some British guns that seemed to have range to the bay entrance. Gálvez then used his authority as Governor of Louisiana to commandeer those ships in the fleet that were from Louisiana. He then boarded the Gálveztown and on March 18 sailed her through the channel and into the bay; the other three Louisiana ships followed, under ineffective British cannon fire. After sending Calvo a detailed description of the channel, the captains under his command all insisted on making the crossing, which they did the very next day. Calvo, claiming that his assignment to deliver Gálvez’ invasion force was complete, sailed the San Ramon back to Havana. On March 24, the Spanish army and militias moved to the center of operations. O’Neill served as aide-decamp and commander of the patrol scouts. After the bay was entered, O’Neill’s patrol scouts landed on the mainland and blunted an attack by 400 mainly Choctaw Indians allied to the British during the afternoon of March 28. These soon joined forces with the Spanish troops arriving from Mobile. During the first weeks of April, the Pensacola fortifications were reconnoitered by O’Neill’s Irish scouts. The furthest redoubt from the city was the Crescent; next was the Sombrero, followed by Fort George. The troops established encampments and began the extensive preparations for the siege. Hundreds of engineers and workers transported supplies and armaments to the battlefield. The men dug trenches, bunkers, and redoubts and constructed a covered road to shield the troops from the constant fire of British cannons, grapeshot, grenades, and howitzers. On April 12, Gálvez was wounded by gunfire while viewing the British fortifications and the battlefield command was formally given to Col. José de Ezpeleta, a personal friend of Gálvez. A further attack by the Choctaws in support of Fort George began on April 19, interrupting siege preparations, and the same day a large fleet was sighted heading towards the bay. At first thought to be British reinforcements, these ships were the combined Spanish and French fleet from Havana headed by of José Solano y Bote and François Aymar, the Baron de Monteil, bringing Spanish Field Marshal Juan Manuel de Cagigal. Reports of a British squadron sighted near Cape San Antonio had reached Havana earlier, and concerned that this fleet would support Pensacola, reinforcements were rushed to Gálvez. The Spanish fleet carried a crew of 1,700 and 1,600 soldiers, raising the total Spanish force to 8,000 men. Solano decided to remain to assist Gálvez after the disembarkation of the troops, and the two men worked closely together. On April 24, a further Indian attack caught the Spanish by surprise, wounding five, including O’Neill’s kinsman, Hibernia Sublieutenant Felipe O’Reilly. On April 26, English soldiers from Queens Redoubt attacked Spanish positions, but O’Neill’s scouts managed to drive the enemy back. The Spanish batteries opened fire on April 30, beginning the full-scale attack on Pensacola fortifications. The Gulf continued its tempestuous storms, and on May 5 and 6, a hurricane again struck the Spanish ships. The Spanish navy was forced to withdraw, fearing that the fierce sea would crash the wooden ships on the shore. The army was on its own to continue the siege. The trenches flooded and the troops were granted a ration of brandy from Gálvez. About May 5, Gálvez received chiefs of the Tallapoosa Creeks who had arrived offering to supply meat for the Spanish camp. Gálvez asked them to intercede with the British-allied Creeks and Choctaws to cease or suspend their attacks, and made arrangements to purchase beef cattle from them. On May 8, a fortunate howitzer blast hit the magazine in Fort Crescent. Black smoke billowed into the sky as the gunpowder supply exploded, killing 57 British troops and devastating the fortifications. Ezpeleta, commanding the light infantry, was then able to lead the charge to take Fort Crescent, and moved howitzers and cannons in place to open fire on the next two fortifications. 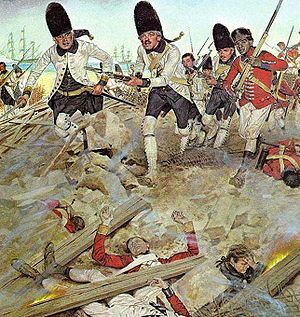 The British fired back from Fort George, but were overwhelmed by the Spanish firepower. Realizing that this final line of fortification could not sustain the barrage, General John Campbell surrendered Fort George and Prince of Wales Redoubt two days later. The British hoisted the white flag from Fort George at 3 in the afternoon on that same day. 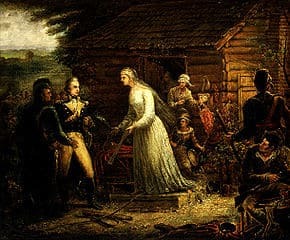 On May 10, 1781, the formal surrender was complete. More than 1,100 British prisoners were taken and another 200 casualties sustained. The Spanish lost 74 men, with 198 wounded. Gálvez personally accepted the surrender and executed the negotiated terms, ending British sovereignty in West Florida. The Spanish fleet sailed out of Pensacola for Havana on June 1 to prepare assaults on remaining British possessions in the Caribbean. O’Neill was appointed by Gálvez as Governor of West Florida, and tendered command of his Hibernia Regiment, which departed with the fleet. The terms of capitulation included the entirety of British West Florida the Spanish captured, in addition to the British garrison, large quantities of war material and supplies, and one British sloop of war. Gálvez had the batteries and Fort Barrancas Coloradas moved closer to the bay entrance, and also built a similar battery on Santa Rosa Island as a precaution against future British attempts on Pensacola. The Tallapoosa Muscogee Creek mission during the siege was likely associated with or directed by Alexander McGillivray, the mixed-race Creek trader. Though a Loyalist, and British colonel in the Revolution, he became a longtime opponent of American colonial intrusions on Creek lands. Raised as a Creek, but educated in South Carolina, McGillivray was seen as a leader by many Creeks. He had been supplying the British in Pensacola, and had organized the British Muskogee Creek contingents who fought alongside the Choctaws. He would become principal Chief of the Upper Creeks in 1783, centered on the Tallapoosa River at Little Tallassee (near Montgomery, Alabama). This act of support for Spain later resulted in the 1784 Treaty of Pensacola giving Spanish guarantees of Creek territory, negotiated by McGillivray, and who later lived in Pensacola, where he died. 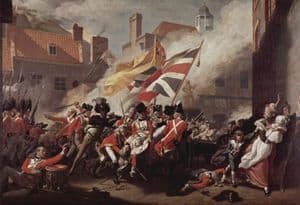 The Spanish took their British prisoners to Havana, and then sent them to the British in New York in an exchange for Spanish prisoners of war, an action that drew protest from the Americans. However, such exchanges were routine at the time, and Gálvez arranged the exchange to extricate captured Spanish soldiers and seamen from the brutal conditions on British prison ships. Gálvez and his men were welcomed as heroes when they arrived in Havana on May 30. King Charles III promoted Gálvez to lieutenant general. Gálvez also was named governor of West Florida as well as Louisiana. The royal commendation also stated that in recognition of Gálvez alone forcing the entrance to the Bay, he could place on his coat of arms the words, Yo Solo. José Solano y Bote was later recognized by King Charles III for his efforts in coming to aid Gálvez with the title Marques del Socorro. A painting showing Solano with his recognitions with Santa Rosa Bay in the background recorded this accomplishment. The painting is now in the Museo Naval of Madrid. A captured British flag is now on display at the new Spanish Army Museum in Toledo.